Last November a book I worked on - alongside nearly 50 other pagan authors and practitioners from different traditions across the world - was published. It is called Every Day Magic - A Pagan Book of Days and contains spells, rituals, meditations, Pagan prayers, divinatory techniques, poems to read and recipes and craft projects to try out; one for every day of the year. The book was my brainchild and I loved compiling all the different entries and seeing the project come together. I'm absolutely delighted to announce that Every Day Magic is also selling well. Publisher Moon Books has told me that it had sold 564 copies by the end of January. That's not bad considering the book was published on 24 November last year, so has only been in shops for about two months. Pictured on the right is Mark Anthony Terry, who contributed entries on spring cleaning, witchcraft legends and ways to align yourself with the changing seasons. 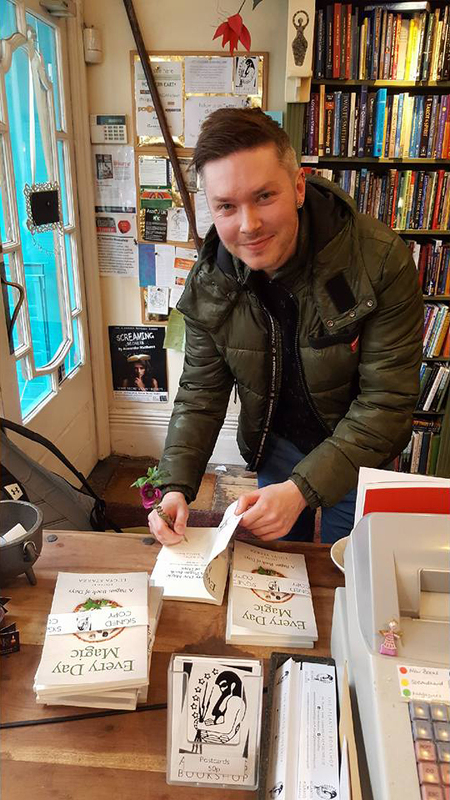 He recently popped into London's Atlantis Bookshop to sign copies. There should still be a few copies signed by Mark and myself available to buy there. Personally, I have been trying to collect the signatures of all of the contributors in my own personal copy. I got quite a few autographs at the Every Day Magic launch party, then asked Rachel Patterson to sign it when I met up with her at the Enchanted Market last weekend. I've still got a few to go though! You can buy copies of Every Day Magic at the Atlantis Bookshop, 49A Museum St, London WC1A 1LY; at Treadwell's Bookshop, 33 Store Street, London WC1E 7BS; and view Every Day Magic on Amazon.